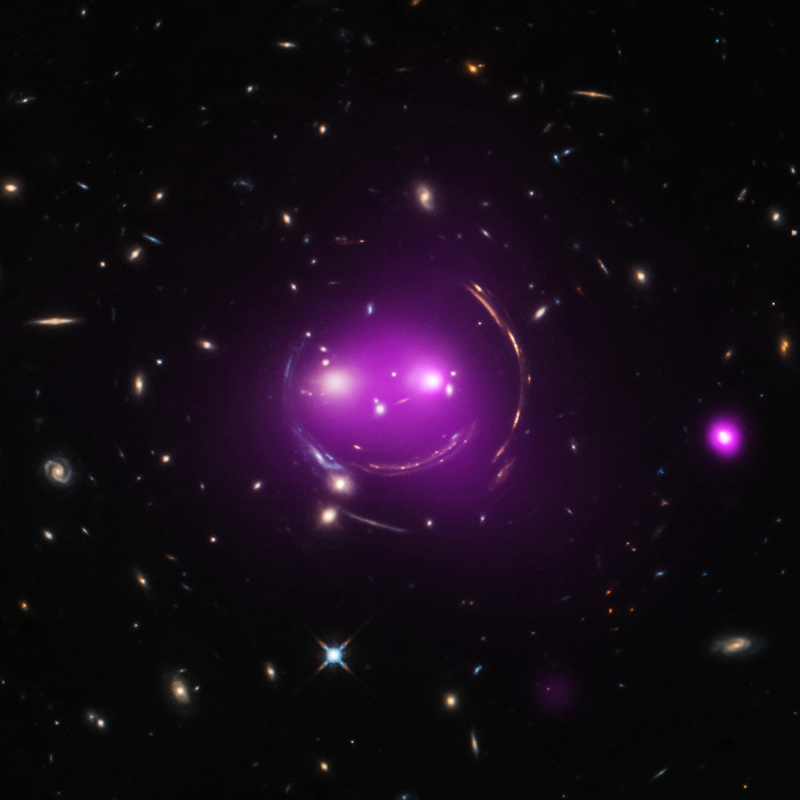 This group of galaxies has been nicknamed the "Cheshire Cat" because of its resemblance to a smiling feline. Some of the cat-like features are actually distant galaxies whose light has been stretched and bent by the large amounts of mass contained in foreground galaxies. This is an effect called "gravitational lensing," predicted by Einstein's Theory of General Relativity that is celebrating its 100th anniversary. X-rays from Chandra show that the two "eye" galaxies and the smaller galaxies associated with them are slamming into one another in a giant galactic collision. A key result of Einstein's theory is that matter warps space-time, and thus a massive object can cause an observable bending of light from a background object. The first success of the theory was the observation, during a solar eclipse, that light from a distant background star was deflected by the predicted amount as it passed near the Sun. Astronomers have since found many examples of this phenomenon, known as "gravitational lensing." More than just a cosmic illusion, gravitational lensing provides astronomers with a way of probing extremely distant galaxies and groups of galaxies in ways that would otherwise be impossible even with the most powerful telescopes. The latest results from the "Cheshire Cat" group of galaxies show how manifestations of Einstein's 100-year-old theory can lead to new discoveries today. Astronomers have given the group this name because of the smiling cat-like appearance. Some of the feline features are actually distant galaxies whose light has been stretched and bent by the large amounts of mass, most of which is in the form of dark matter detectable only through its gravitational effect, found in the system. More specifically, the mass that distorts the faraway galactic light is found surrounding the two giant "eye" galaxies and a "nose" galaxy. The multiple arcs of the circular "face" arise from gravitational lensing of four different background galaxies well behind the "eye" galaxies. The individual galaxies of the system, as well as the gravitationally lensed arcs, are seen in optical light from NASA's Hubble Space Telescope. Each "eye" galaxy is the brightest member of its own group of galaxies and these two groups are racing toward one another at over 300,000 miles per hour. 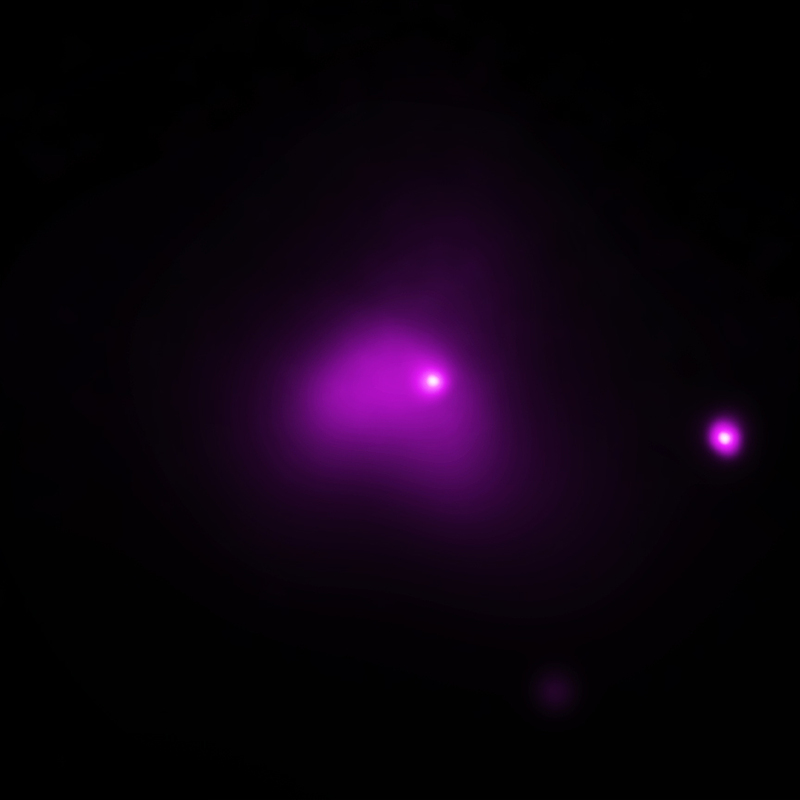 Data from NASA's Chandra X-ray Observatory (purple) show hot gas that has been heated to millions of degrees, which is evidence that the galaxy groups are slamming into one another. Chandra's X-ray data also reveal that the left "eye" of the Cheshire Cat group contains an actively feeding supermassive black hole at the center of the galaxy. The Cheshire Cat represents the first opportunity for astronomers to study a fossil group progenitor. Astronomers estimate that the two "eyes" of the cat will merge in about one billion years, leaving one very large galaxy and dozens of much smaller ones in a combined group. At that point it will have become a fossil group and a more appropriate name may be the "Cyclops" group. A new paper on the Cheshire Cat was recently published in The Astrophysical Journal and appears online. The authors are Jimmy Irwin (University of Alabama), Renato Dupke (National Observatory of Brazil), Rodrigo Carrasco (Gemini Observatory), Peter Maksym (Harvard-Smithsonian Center for Astrophysics), Lucas Johnson, Raymond White III (Alabama). Coordinates (J2000) RA 10h 38m 47.44s | Dec +48° 48´ 12.7"
Hi, I was wondering the exact date this photo was taken on. And what it was taken with? This is totally awesome... And what a brilliant man Einstein was and it seems still is. The whole CHANDRA experience, including ACIS, is just mind-blowing to me. I'm not a scientist or astrophysicist, but this is simply wonderful, and the thought that went into isolating bands of x-rays and other spectra is astonishing to me. Keep up the good work, and I tell everyone I can that this is the type of science that is ESSENTIAL to our ultimate understanding of how everything works. Thank you for your efforts and research work, all of you. About 4.6 billion light years. X-rays from the Chandra, optical data from Hubble telescope. About 1.45 million light years across.